The following articles are a sampling of media coverage on the FPB concept. For more historical press, scroll down. July 2017 features an extensive article on the Dashews and FPB 78-1 Cochise. On stands now! Motor Boat & Yachting June 2017 features FPB 64 and 78-2 owner Pete Rossin, detailing his incredible journey to 80 degrees North…Read here. Yachting World November 2016 features Sundeer line as one of 50 Yacht Designs that changed the world. Berthon Lifestyle highlights FPB 64 Buffalo Nickel’s extraordinary cruise through Vanuatu. Read here. Powerboat World heralds “a new dawn in efficiency and performance” with the Wicked FPB 97… Read the article. What would you assume is the ocean-crossing yacht of choice for the editor of a preeminent megayacht magazine who’s seen it all? Read Stewart Campbell’s editor’s letter in the April 2015 edition of Boat International to find out. Motor Boat & Yachting have anointed Steve & Linda with the prestigious 2015 Judges’ Special Award for innovation in Design (the award is such an honor that they don’t bestow it every year). In the April issue of Boat International, Ivor Wilkins takes a detailed look at FPB 97-1 Iceberg, and the FPB concept. In the story above, Ivor Wilkins alludes to the fact that Dashew Offshore designs are in the unusual position of having strong followings on both power and sailing sides of the cruising equation. That said, traditionally there is no love lost between sailors and those who choose power. This puts the sailing magazine Yachting World’s editor comments in the November 2014 issue in an interesting light. To read Matthew Sheehan’s thoughts on the FPB 64, click here. We always strive to be conservative in our claims for boat speed and range. To find out just how far and how fast you can go in an FPB 64, read Peter Watson’s account of his 90 day, halfway around the world journey from Auckland, New Zealand to the UK’s Channel Islands in Motor Boat & Yachting. The following article on one of FPB 64-5 Tiger‘s south pacific cruises may seem exotic to most. Rather than being an outlier, however, this is the norm for Dashew Offshore’s sailing and power fleet of yachts. Click here to read. “We only cleaned the air filter and changed the oil and oil filter. Nothing else.” Read more of Peter Watson’s deminavigation in the latest issue of Power Source. The UK yachting press has a reputation for maintaining fierce independence when it comes to reviewing boats. Beholden to no one, designers and builders are often leery about allowing British press free reign on board. To find out what Motor Boat & Yachting thinks of FPB 64 Grey Wolf and FPB series prototype Wind Horse, click here. Ten years ago, when the FPB series prototype Wind Horse was launched, PassageMaker magazine founder and editor Bill Parlatore made a trip to New Zealand to have a close look at this new breed of ocean-crossing yacht. In light of the FPB paradigm’s success in the last decade, Bill Parlatore’s detailed analysis should be of interest. Crossing over to the dark side: Interesting thoughts on the birthing process of the FPB concept. From Yachting World magazine. Click here. “…It’s the sort of machine that will make oceans shiver in fear.” Read the PDF of the feature here. “The first of Steve Dashew’s FPB 78 ocean-cruising yachts is scheduled to start cutting metal this September at Circa Marine in New Zealand.” Read full article. Click here to read whole article. “A robust ocean-cruising yacht, the FPB 97 is for owners who want the option of self-navigation without crew. Able to withstand extreme conditions, with self-righting capability, it has the toughest structure ever offered in a series-built yacht.” Click here for PDF. 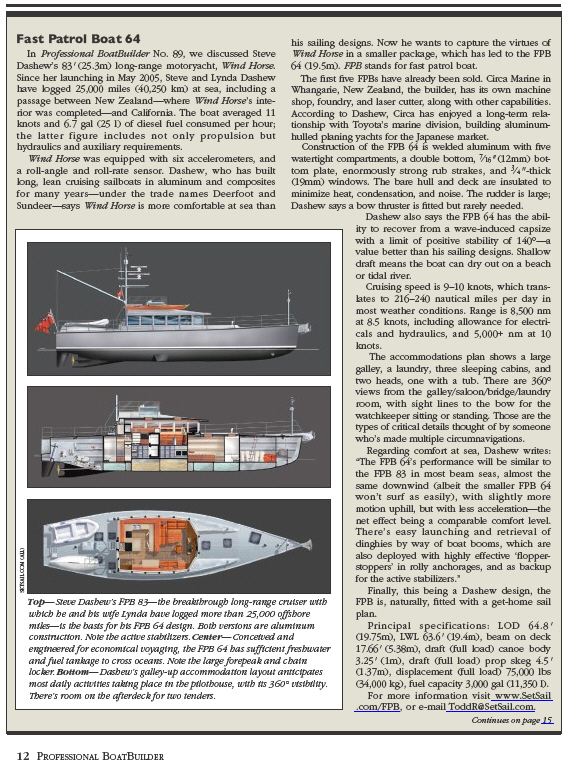 “In keeping with her predecessors, the FPB 97 is designed for optimal comfort and safety, with proven sea-kindliness, heavy-weather capabilities, including self-righting recovery from capsize, and robust systems engineered for minimum maintenance.” Click here for PDF of full review. “Steve Dashew has added his newest design to his successful FPB line of ocean cruising yachts with the Wicked FPB 97.” Click here for full article. “Size matters when owners want the freedom to cruise with or without crew, and the latest model in Steve Dashew’s FPB line of ocean cruising yachts has been designed with this in mind.” Click here to read full article. Yachting reviews the FPB 115. Click here to read article on Yachting’s site. “On Top of the World: Wind Horse rides the fjords of Svalbard to 80 degrees North.” Click here. Elaine Bunting interviewed Steve & Linda for Yachting World. Click here. Click here for full article and pictures. Click here for a review in the Italian magazine Y&S Yacht & Sail. “London Calling: Seasoned voyagers discover the magic of the historic St. Katharine Docks and England’s vibrant capital.” Click here for an article Steve & Linda wrote for Yachting magazine. Click here for a review in the French magazine Neptune. Click here for Hidden Anchorages, an article written by Linda Dashew while cruising aboard Wind Horse in Norway this summer. “Meet the owners who built the wave-piercing aluminum-hulled 80-footer to get them to any corner of the blue planet they fancy.” Click here for a PDF. Click here for PDF of the article and photos. It helps if you read Croatian! See pages 42-47 for “Switching Sides: Longtime sailors make the switch to power”, or click here for a PDF of the article. See page 134 of this issue for “After 35,000 Miles” by Steve & Linda Dashew. You can sign up to view this magazine issue online at http://www.passagemaker-digital.com/passagemaker/200812/. Check out the June/July 2008 edition of Professional Boatbuilding Magaine for a full-page review on the FPB 64! Click here for a screen shot of the review. 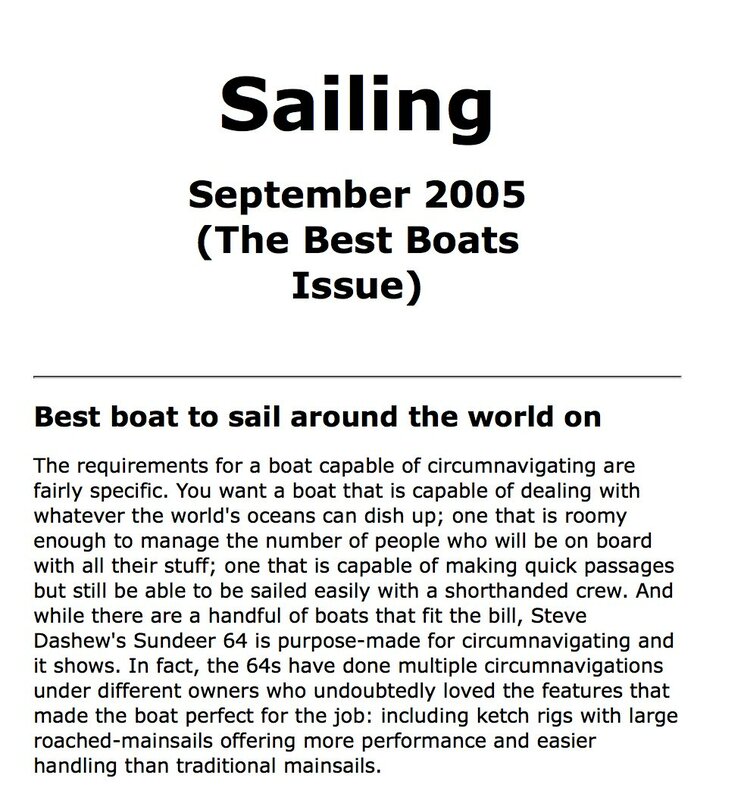 You can also read it on the magazine’s web site – www.proboat.com. “Sundeer 64: Best boat to sail around the world on.” Click here for review. “Beowulf bares all. ” Click here for cover story by Ivor Wilkins. For more information on the FPB Series, e-mail Sue Grant: Sue.Grant@Berthon.Co.UK.